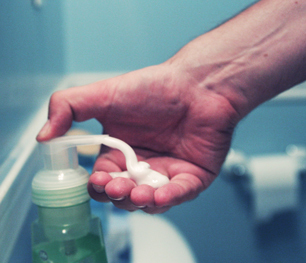 Triclosan is commonly found in antibacterial hand soaps. Triclosan has been detected in waste water, surface waters and soil in the United States. Human exposure is expected to occur occupationally in factories where the chemical is used or produced, and by the general population through products that contain the chemical. Triclosan is non-toxic to mammals with acute exposure, although reports indicate that it can cause skin irritation. A recent study by the University of California, Davis, indicates that long term exposure to triclosan can impair the functioning of skeletal and heart muscles in rats. So far, long term studies have not shown evidence of carcinogenicity. Triclosan is also of environmental concern. Although it is immobile in soil, it can bioaccumulate in exposed aquatic animals. For some aquatic species the chemical is toxic, and it can have endocrine disrupting effects on others. There is also concern that triclosan and other antibiotics in the environment will lead to the growth of drug-resistant bacteria. Research from the University of South Australia indicates that triclosan may be effectively treated with activated carbon.